A Northern Light is a stark, haunting, beautiful novel. As one would expect from a book described as stark and haunting, much of it is dark and depressing. I generally like darkness in a novel. But sometimes I am in the mood for something cheery. I was, unfortunately, in such a mood while I was reading A Northern Light. If I'd been smart, I would have put it down and picked it up at a different time, but I'd been wanting to read the book for such a long time that I pushed through it. I enjoyed A Northern Light, but I probably would have liked it more if I'd been in a different mood. Mattie is the star of our novel. She is an avid-booklover and wordsmith, which makes her immediately endearing to the reader. Mattie is stuck between a rock and a hard place. She desperately wants something more of her life: to go to college, get of of her small town, and become a writer. Yet with her mother's death, her father's embitterment, and her family's poverty, the chief burdens of care-taking have fallen upon Mattie. Her family needs her. Mattie may want out, but her love and duty to her family comes first. The book alternates between the past and present - not a significant difference - between about spring and summer - and finally merges together at the end of the book. In the spring, Mattie wants to get away but is wracked with guilt. In the summer, Mattie has gotten away - to a job at a nearby resort - but thinks she'll probably never go further from home than that. All this changes when Mattie reads the letters of a young woman, a guest of the resort, is murdered. I particularly liked some of the side characters. Mattie's best friend Weaver was a likeable, layered character. He was scary smart, funny, and loyal. As the only black young man in their small town, he aspired to become a lawyer and bring forth justice. He also tended to overreact at any perceived slight, which was understandable but not particularly smart given the time period. Ms. Wilcox, Mattie's teacher, was also wonderful. She helped open Mattie's eyes to the beauty and sorry of the world. I even liked Mattie's quasi-beau Royal. Like may not be the right word, but I appreciated him. He was handsome, arrogant, narrow-minded, and dull, but he felt real. I liked the role he played in the book, even if many of his actions were despicable. The writing of this novel is both good and bad. Prose good, plotting bad. Donnelly's prose is full of imagery and emotion. Her words soak into your skin as you read them like a warm, sunny day (sorry - my attempts at artful prose is not as good, but you get my drift). It's like reading poetry. Unfortunately, the plotting is not as good. The book is overly ambitious. There are a dozen plot points and there isn't time enough to explore even half of them thoroughly. I like books that challenge me to think as I'm reading, but this made me work and then left me hanging. I particularly disliked the fact that the murdered woman's letters are set up as being the keystone of the novel, but they didn't appear until we were significantly through the book. While I could tell what influence Donnelly wanted me to believe the letters had on Mattie, the book didn't really convince me. Also, the time shifts were confusing. They were often sudden and there was no notation whether it was past or present. I was able to figure it out eventually through context, but it took away from my enjoyment of the plot. I appreciate the use of time shifts as a literary trick, but I would rather marvel at the story itself than the craft of writing. A Northern Light is a good book, but could have been better. Luckily, Donnelly appears to have learned from her early works, because her new YA book Revolution is absolutely wonderful. I still recommend A Northern Light to anyone who likes skilled prose, a strong main character, historical fiction, and dark themes. Sorry to hear that your mood dampened this one, Alison. I really was really surprised how much I loved "A Northern Light". I avoided this book because of its cover and thought it would be a really boring book, but I was glad to be proved wrong. I thought Mattie was a wonderful, strong female character who tried to balance what was expected of her but also wanting to follow her heart. I loved how she desired to be a writer and the vocab words for each of her chapter added an additional layer to the story. I got swept away and didn't think the pace was off. I remember reading this one and loving it. It was a long time ago, I wonder what I would think if I reread it. I haven't read this book by her, but I really liked "Revolution". I guess I won't be picking this one up...it doesn't sound as interesting. Thanks for the review! Mood and cover influence my reading of a novel. Say a novel has a fluff cover and turns out to be a serious novel, I am immediately turned off. Same with my mood, especially when a review is due and I'm forced to read it. So true that you have to be in the mood for a book. I tend to shy away from darker books---life is hard enough, I want to read about something happy! Oh my gosh, I live near the lake where Grace Brown drowned...it's so creepy. I love anything that has to do with her story, but I hadn't heard of this book before! But now I am not sure if I want to read Northern Light. Thank you for a great and honest review. Aw I'm sorry this book fell a little short for you. This is one of my favorite books. I haven't read it in years but I have loved it for quite some time. I'm glad that you really enjoyed her other book though, I still haven't gotten a chance to read that one. I've read my fair share of overly ambitious stories and I can't help but think of them as bit hot messes. It always saddens me because it often feels like the main intent of the novel gets lost. I've been dying to read this book, so it's great to have your perspective. I've only read one book by this author (the first Rose book, adult) and I really liked it, but it was an uneven 3 star read for me as well. Great review. Sounds like a really good read, but bummer about the plot being too ambitious for the novel. Still though, the murder/letters plot sounds interesting and I'm a sucker for dark historicals, and will probably check this one out. Mood is crucial to my enjoyment of a book too. I have heard so many good things about the author's writing - I really should get around to reading it. I'm thinking I'll start with Revolution though if you think she has improved with respect to plotting and such with that one. I really enjoyed this book, but I too thought there was a lot going on in the plot. Sometimes I lost track of what was happening. 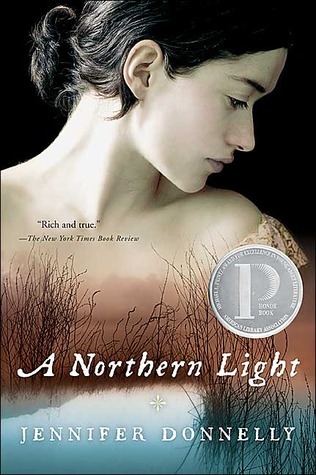 Still, I loved reading about Mattie, and A Northern Light is 1 of only 3 books that has *almost* made me cry. Luckily I was reading this WHILE working, so I was able to recover from potential tears buy busying myself! I loved the hook of the letters as I adore the film "A Place in the Sun" based on the same murder. I also loved Donnelly's writing in Revolution. But this book just didn't work for me-I think the poverty of the area depressed me and then I would have to agree with you about the plotting in being not to my taste.